Health and wellness have converged into a revolution sparked by media, and food brands are at the forefront of fueling it - creating cleaner, more natural products that are better for us and the world. As consumers adapt healthier and more sustainable ways of consuming products, they are turning to digital to discover food brands. Natural food brands need to stay ahead of the curve on the trends and new ways of reaching those consumers who are primarily online. Juice cleanses, Whole30, kale everything - while some of these trends come and go, most are indicative of a more open-minded society willing to try new ways of eating. Here are some of the larger scope trends that brands should pay attention to when it comes to understanding an audience that is tech-savvy, health-conscious and hungry for more. Non-gmo, gluten-free, vegan, farm-raised, organic, ethically-sourced, organic, keto, paleo, Kosher - the list goes on when it comes to the types of food restrictions people are following these days. While many people are restricted to some of these types of diets because of health issues or allergies, we’ve seen a wave in adoption of trying these out solely based on choice. While the percentage of those with celiac disease has remained flat since 2009, more than three million people across the United States follow a gluten-free diet. 72% of them classify themselves as "PWAGs" - people without celiac disease avoiding gluten. Since 2009, the Whole30 diet (30 days of eating primarily meat, veggies, eggs and fruit) has been completed by millions of people - with a majority of them doing the diet to improve energy, mood and sleep quality, not just to lose weight. Going vegetarian for a week or only buying organic produce at the store are small adjustments to our daily diets that have larger outcomes for our health and the environment - and people are catching on. According to Nielsen, more than half of consumers believe that the absence of undesirable ingredients is more important than the inclusion of beneficial ones. AKA less is more. A simple rule of thumb health experts like to preach is if you can’t pronounce the ingredient, you probably shouldn’t be eating it. RX Bar has harnessed this and isn’t afraid of showing how few ingredients are included in their bars - slabbing it right on the front of their label in large font for everyone to see. People love that there are only a handful of ingredients in the bar because that means there’s no added sugar, preservatives, or as RX Bar puts it - No B.S. What started out as a basement project turned into a booming business the big dogs couldn’t stop watching - and in October 2017, they sold to Kellogg’s for $600 million. People want cleaner food, plain and simple. Less chemicals, less preservatives, less sugar and fats, and less “B.S.” leads to a healthier and purer life. According to the CDC, approximately 610,000 people die of heart disease in the U.S. every year – that's 1 in every 4 deaths. Large portions and cuts of meat with high fat content, excess sodium, processed or canned foods, and unhealthy fats and carbohydrates are all factors contributing to why heart disease is the leading cause of death for both men and women. As consumers look to improve their health and avoid common diet-related diseases like the above as well as diabetes, they’re on the lookout for new ways to enjoy the traditional foods they love - but in healthier, more innovative ways. Take Follow Your Heart, for example. This vegan company creates delicious alternatives to many of the foods we love - their product offering includes a vegan mayonnaise, eggs, cheese and dips/spreads. This vegan-friendly brand even makes their products readily accessible through popular online health-food providers like Thrive Market - the new online mecca for health food products and brands. Beyond Meat is one of the front-runners in the the faux-meat industry, providing an impressive selection of plant-based ground ‘meat,’ sausages, burger patties, chicken strips and even ‘beef’ crumble for tacos. Beyond Meat’s packaging and products are made to resemble the look, taste, texture and even smell of real meat - making it the perfect product for both the fun-loving vegan and the manly-man who’s hesitant to replace his protein intake with a plant-based option. As our schedules get busier and we choose to skip the drive-thru line at lunch, many will opt for a health food bar or protein snack that will do the job and keep us fueled between meals. Overall meal replacers are on the rise, which is an important note to make since it provides more insight into why the snack industry is booming - which in large part is due to millennials. According to Forbes, millennials are likely to snack four times a day or more. 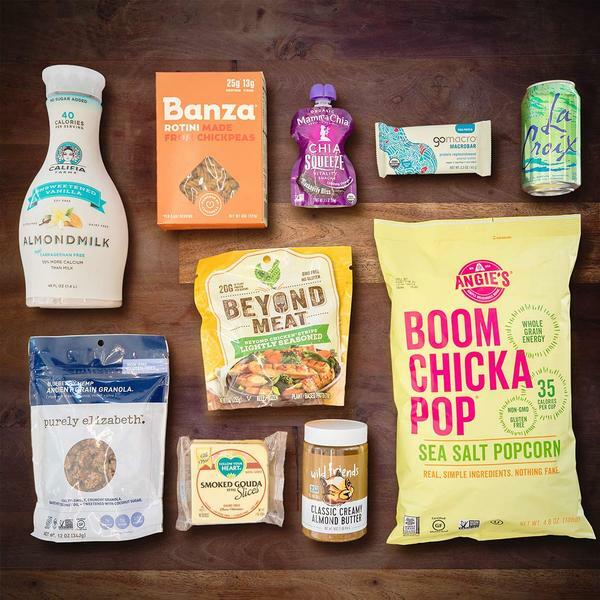 Spending an average of $600 billion each year, it’s no wonder that millennials are fueling the snack food movement and contributing to the CPG health food industry’s success. What we eat and how we consume our foods takes a toll on the environment - not just through what we throw away or don’t eat - but through what we’re actually consuming. Our food system contributes about 30% of total U.S. greenhouse gas emissions, with the largest proportion coming from animal-based food. 80-90% of water consumed in the U.S. is by animal agriculture, not humans. According to the Netflix documentary What the Health, raising animals for food is the leading cause of rainforest destruction, species extinction, ocean dead zones and fresh water consumption. Meat production isn’t the only food industry harming the environment. The mass production of corn and soy (two staples that can be found in practically any processed food) is made possible by deforestation - which contributes a hefty load of greenhouse gas emissions into the air - and causes soil erosion, leading to increased amounts of pesticides and fertilizers to be used. Every step in the process takes a hit at our environment, from planting the seed to delivering the final product hundreds of miles away. Brands are starting to take responsibility and practice more sustainable processes, using locally-sourced ingredients, recyclable packaging and giving back to community and nationwide programs focused on improving the environment. Everything we ever need to know is at our fingertips. When it comes to learning more about a health food brand or product, most likely we’ll go straight to Google or social media to find what we’re looking for. Digital is the reason health food brands have been able to thrive and cultivate communities of loyal customers. Why? Because discovery happens online. People are researching their food products online and making purchase decisions based on what they find there. Brands are being judged based on their website, social media and what kind of information is available to the visitor. Health food blogs, YouTube channels dedicated to “What I Eat in a Day” type videos, health and diet podcasts, TV shows dedicated to healthy recipes, food and climate documentaries - health food is all the talk these days and people are tuning in across the board. Social media is one of the biggest vehicles for the trend, and brands who aren’t on board are missing out. Search any hashtag related to healthy eating or a type of food, and millions of photos will be waiting to be scrolled through. Influencers who curate their content around health and wellness are helping drive awareness, traffic and sales to health food brands - but in creative and far from ‘salesy’ ways. Take this photo for example by Instagrammer @restoring_radiance. She incorporates subtle product shots and mentions into her mouth-watering feed, sparking interest in brands and products in an effortless fashion. Brands like La Croix sparkling water and Banza Pasta have seen their social media followings soar as they partner with more influencers, produce compelling ads, and serve up creative content to a visual-first audience. There was once a time when you could only buy your favorite health food bar or drink at the grocery store. As digital continues to dominate, CPG (consumer-packaged goods) brands are realizing the importance of having a strong online presence and offering consumers the chance to purchase their products directly from their site. Amazon, Safeway, Walmart and other big grocers have also caught on by working with eCommerce sites like InstaCart to accommodate the online shopper. Home grocery delivery services and eCommerce membership-based retailers like Thrive Market are changing the game for healthy consumers who want a one-stop shop for their favorite natural and organic products, offering price-friendly options and doorstep delivery. Learn more about how eCommerce is changing the grocery market. Companies looking to enter the health food industry or build upon their existing brand should consider some key tips. Focus on harnessing digital. This means having your website optimized for site speed and a seamless checkout process. Make sure your social media game is on point and you’re capitalizing on the power of influencers. Produce compelling, creative content that stands out. Engage with your customers online, and keep the conversation going. Make sure your email campaigns are flawless, engaging and offering something valuable to your audience. Use more video. Video is projected to claim more than 80% of all web traffic by 2019, and 90% of customers report that product videos help them make purchasing decisions, according to Hubspot. Voice search is becoming more popular as our smart devices become smarter. Make sure your team can effectively keep up with its paid search and Amazon marketing campaigns. What is your unique value proposition and why does it matter? The first step is solidifying that answer, the second step is communicating that to your audience. Maybe your product caters to those with nut allergies or someone looking to incorporate more protein or nutrients into their diet. Whatever it may be, understand your audience’s needs and desires. Get a feel for what flavors they like or don’t like, what kinds of social posts perform the best, what kind of content they like. Monitor ad performance for promotions and deals, send out a survey or take a poll. Learning more about your audience each day will help you craft your message more effectively and sharpen your brand’s strategy to win hearts and stomachs near and far. Honesty is the best policy. In fact, 94% of people are likely to be loyal to that brand if it offers complete transparency. This applies to anything and everything pertaining to your product: from how it’s made, to what’s inside, to how it will benefit you. Take San Diego-based juice company, Solti, for example, who has a page called "Our Process" on their site dedicated to explaining every step in how their organic, glass-bottled juices are made. The video shows how the ingredients are sourced and cold-pressed, takes you through their special light filtration process and how the products are bottled in a sustainable fashion. Anyone else thirsty after watching this video? People are more curious than ever before when it comes to what they’re putting inside their bodies, so make sure to disclose everything and highlight any impressive features of your product. Strive to make a difference and make your customers feel like they’re making a difference. It’s as simple as that. Giving back to the community or a certain cause instantly adds more gratification for the customer when buying your product, as well as for you since you know your company is sharing the success with those who need it most. GoMacro does an excellent job of showcasing how they give back to the community, by highlighting the organizations (like Keep A Breast, Feeding America, + more) they’ve partnered with to receive proceeds from their “GiveBack” bars. Not to mention they take sustainability to the next level. Their wrappers are manufactured from 100% post-consumer waste and their tray packages are compostable. They donate their leftover food scrap to local farms to be repurposed as animal feed, and use occupancy sensors in their lighting to save energy. Be proud of your accomplishments and highlight the philanthropic elements of your brand in an evergreen place like your website. That way, new visitors or those who have never heard of your brand can see that you care about important causes and are not a business just looking to make money, but a business looking to do good as well. Published on March 28, 2018 .